The CLAW pencil grip comes in two sizes – small and medium. 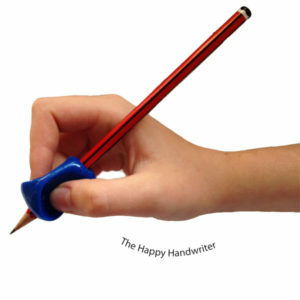 I love the CLAW pencil grip as it is good for children who are using a thumb wrap or other modification to their grip. Although I initially thought the cups for the fingers looked clumsy, the children seem to find them very comfortable and I have achieved good results with these grips. I like the fact that they place the fingers in the correct position while facilitating finger movements which is what gives us speed and quality of handwriting. The medium size is recommended for most school going children, while the small is usually best for pre-schoolers with very small fingers. It can be difficult to ascertain which the correct sized grip is – if you are uncertain you can try the Multi-Pack which gives one small and one medium – along with two other kinds of grips – and you can try out which best suits your child. Remember pencil grips are a bit like hammers and nails – they go best when used together. You can’t use a pencil grip in isolation – you need to work on developing the muscles and movement patterns for pencil control as well. Take a look at the Fine Motor Fun kit which has a large variety of activities that target exactly this. The CLAW fits easily onto either a standard sized pencil or a twisty crayon. Looking for a larger pack? Take a look at our pack of 6. Children love the CLAW grip and call it their Spiderman Web-blaster! The CLAW grip supports the fingers and encourages a dynamic pencil grasp whilst assisting in the development of fine isolated finger movements necessary to control the writing tool. The grips can fit onto pencils and crayon pencils. The grip is also useful for adults! I have recently given a grip to a 5th year medical student, who reported that she found it most helpful in increasing her endurance and combating finger cramps during exams.